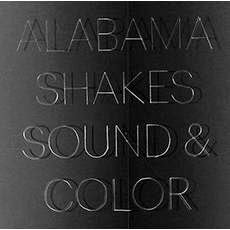 Alabama Shakes really struck gold with their debut album Boys & Girls, now just about three years later they are returning with the follow-up Sound & Color (out April 20th). For one reason or another, the first record simply passed me by, so I come to Sound & Color without a preconceived idea of what to expect. I come away from it wondering what all the fuss is about. Too many of the songs are unremarkable. They have a vaguely souful falsetto vocal laid down atop a plodding arrangement. It's all quite pedestrian and well, rather lifeless. Songs like "Shoegaze" and "This Feeling" are among the biggest culprits, coming across as methodical to the point of being sluggish. The smooth '70s aura of "Guess Who" is more than a touch too mellow. The title track and the six-and-a-half-minute "Gemini" are a different story with a unique structure. They sound like organic Trip Hop. It's as though Massive Attack stripped out the electronics and replaced it with glockenspiel and other percussion. While the experiment should be applauded, the results are mixed at best. There are a few exceptions. "Don't Want To Fight" adds some funky vibes to the mix. The tempo and volume pick up for the more urgent "The Greatest". A gritty blues component makes "Miss You" a standout. Even without really experiencing the debut, it's hard not to come away from Sound & Color being disappointed. Alabama Shakes play the Field Trip festival in Toronto on June 6th. Best tracks: "The Greatest", "Miss You"